Karastan makes it easier and more fashionable to live green with a new generation of carpet fibers made from corn-based polymers. This polymer is called DuPont™ Sorona® renewably sourced polymer and it is as good for the environment as it is for you. It is also an important ingredient in Karastan's SmartStrand® - a remarkabley stain resistant, durable, soft, beautiful, long lasting and earth friendly carpet fiber. These smart attributes are even more brilliant when you consider that 37% of the Sorona® polymer comes from renewable resources instead of the more limited petroleum based ingredients in most other carpets. By utilizing renewable ingredients that can be infinitely replaced - like corn - Karastan is able to create beautiful carpets, while preserving the earth's nonrenewable resources for future generations. « For every 7 yards of SmartStrand® with DuPont Sorona®, renewably sourced polymer purchased, enough energy is saved to equal one gallon of gasoline. « The production of the Sorona® polymer requires 30% less energy. « The production of DuPont™ Sorona® renewably sourced polymer also reduces CO2 emissions by 63% over the production of an equal amount of nylon 6. As a leader in the carpet and rug industry, Karastan holds a position of environmental responsibility it takes seriously. We continually strive to develop responsible solutions that help you make smart choices for your home and for the world. « 37% of SmartStrand® with DuPont™ Sorona® renewably sourced polymer is produced with readily available agricultural materials that include corn sugars. « Excellent colorfastness properties, which resist fading and are covered by Karastan’s 10 year Color Fast Warranty. 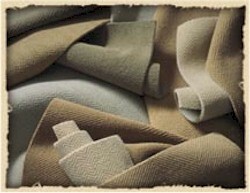 « Durability that is backed by Karastan’s exclusive Lifetime Limited Manufacturing Defects Warranty. « Karastan SmartStrand® carpets made with DuPont™ Sorona® renewably sourced polymer are CRI Green Label Plus certified for low emissions.